Spanish is one of the most widely spoken languages in the world. Outside of Spain, most of fthe world's Spanish speakers are located in the Americas. The close proximity of these countries to the United States makes knowledge of Spanish very useful to Americans. Not everyone has the time and energy to master Spanish and yet the need for occasional translation remains. Hiring an expert translator is a good option for contracts and specialized technical documents. What about the occasional phrase or news article? Using a free service like Google translate is the best way to go. Google Translate can be accessed in several different ways. For example, companies and other organizations can embed Google Translate directly into their websites. If your website has users from around the world, embedding Google Translate makes the website easier to use for an international audience. 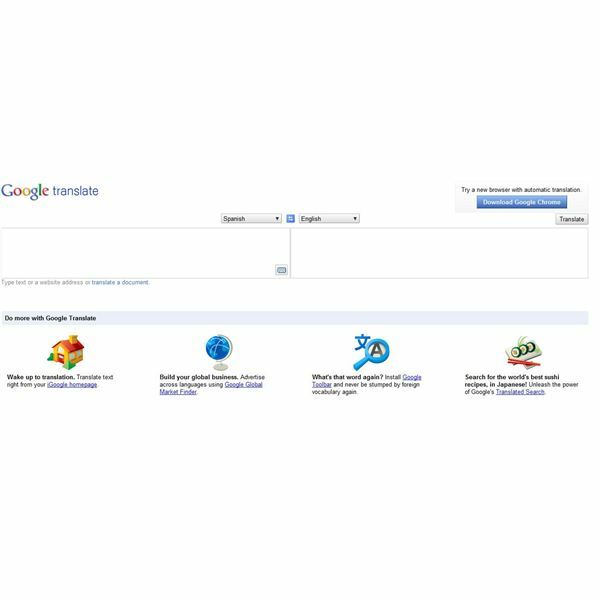 Google Translate is also built in to other Google services such as Google search. Fore example, if you've ever seen the "Translate This Page" next to a search result, then you've just seen Google translate in action. Go to the Google Translate website. Copy and paste the text to be translated into the left hand text book. If you have an entire document to be translated, click the "translate a document" link. Press Enter when you are finished entering text. Read the translation provided on the right hand side of Google Translate. (optional) Click "listen" to hear a recording of either the original Spanish or English text. To get the most out of Google Translate, consider the service's features and limitations. In addition to the service's technological issues, it is important to understand the Spanish specific issues that can arise when using the service. Dialects and Regional Differences: Google Translate may not be able to tell the difference between Mexican Spanish and Spanish as spoken in Spain. Spanish accents: If you are using a basic keyboard designed for U.S. English, you may have difficulty entering all the right Spanish accents. Fortunately, Google Translate has an on-screen keyboard to help users enter all the right accents. Grammar: If you don't understand Spanish grammar and syntax, Google Translate will not be able to help you very much. Google Translate as Dictionary: The service can be used to look up one word at a time. Technical and Professional Spanish: If you are attempting to translate a historical Spanish document, a medical text or an engineering manual, Google translate may produce errors when it attempts to process this type of text. Be forewarned that Google translate's performance in these situations may be disappointing.